Planting trees is a wonderful way to celebrate a special occasion. For every dollar you donate, American Forests will plant a tree in a wildland restoration project in one of our priority threatened ecosystems. These trees will stand as vital reminders of the special moments worth commemorating in our lives. Each donation is honored with a personalized electronic certificate which you can present to the recipient of your gift. 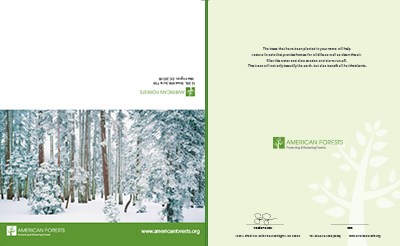 As an additional thank you, we will also send them a one-year gift membership to American Forests, which includes a subscription to our award-winning magazine, American Forests. Planting trees is a wonderful way to celebrate a special occasion with your customers and employees. For every dollar you donate, American Forests will plant a tree in a wildland restoration project in one of our priority threatened ecosystems. e.g. company name; CEO name; etc. Click here for individual state disclosure information. Your gift helps protect & restore our forests, which provide critical benefits to humans and wildlife and are essential to all life on the planet. of drinking water in the U.S. comes from forests. of the world’s terrestrial biodiversity lives in forests. of greenhouse gas emissions in the U.S. are absorbed by forests each year. of forest can provide enough oxygen for more than 500 people each year. — Michael R., Washington, D.C.